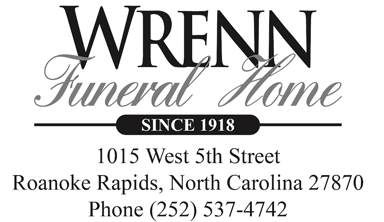 Mary Perry West, 88, died on Saturday, November 3, 2018, at Magnolia Gardens in Roanoke Rapids. She was a Halifax County native born to the late William Jackson and Myrtice Parks Perry, and she was also preceded in death by her husband, Thomas Ray West. Rev. 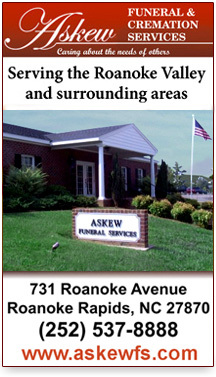 Mike Currin will conduct graveside services at 2:00 pm on Tuesday, November 6th at Sunset Hill Cemetery. Mrs. West is survived by her children, Judy Wilson and husband, Keith, Ronny West and wife, Lynne, and Carolyn Hamill and husband, Steve and Gloria and husband, JR.; her grandchildren, Paul Smith, Brent Hamill and wife, Jessica, Brad Hamill and wife, Kristin, Brittney Pope and husband, John, and Jordan West; and her great grandchildren, Kaylan Smith, Jarrett Smith, Justis Smith, Wesley Smith, Teagan Hamill, Grayson Hamill, Maddyn Pope and Tenley Hamill. In lieu of flowers the family asks that memorials be made to the Littleton Baptist Church or to Magnolia Gardens. 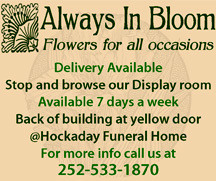 Arrangements are by Blaylock Funeral Home in Littleton.